Just about 2000 years ago, the Apostle Paul, a church planter, wrote these words to the church at Philippi, in modern-day Greece: "I thank God in all my remembrance of you, always in every prayer of mine for you all making my prayer with joy, because of your partnership in the gospel from the first day until now" (Philippians 1:3-5). Partnership in the gospel. Paul understood then what SENT looks to model today: an instilled sense of partnership with local churches which stand for the gospel and the advancement of God’s Kingdom. Paul makes his prayer with joy and thanksgiving as he presses forward in his partnership with the believers at the Philippian church, knowing that, as he explained to the Roman believers, each partaker of grace in the gospel would be mutually encouraged by one another’s faith (Romans 1:8-12). Not only did Paul write to the churches with both fondness (Philippians, Ephesians) and concern and reproof (1 and 2 Corinthians, Galatians), but he also portioned significance in visiting these churches to encourage and strengthen them. “And after some days Paul said to Barnabas, ‘Let us return and visit the brothers in every city where we proclaimed the word of the Lord, and see how they are’… And he went through Syria and Cilicia, strengthening the churches” (Acts 15:36, Acts 15:41). Paul’s emphasis on a partnership in the gospel includes an understanding of the local church’s larger mission of joyful participation in planting more churches. This week, we celebrate the work the Lord is doing in a few church partnerships of our own. SENT Network Executive Director Mark McGeever visited three partner church plants over the last month, celebrating one-year and two-year anniversaries of the first day these men and women opened their doors to invite their communities into the great redemption story of our God! In Baltimore, Redemption City Church, pastored by Adam Muhtaseb, celebrated one year of publicly gathering as church community, reflecting on the faithful evangelism and discipleship they’ve brought to the greater Baltimore area. RCC’s biggest strategy and mission is for its people to give their lives to display and declare the gospel. SENT Network partner Pastor Eric So and Peace City Church in Riverdale, Maryland also recently crossed into the second year of the life of their church. In what Peace City describes as a landing zone for immigrant and refugee families with limited means, Peace City exists to combat brokenness and spiritual deadness in the diverse yet disconnected community of Riverdale through the ultimate unifier and healer: the peace of God in the gospel of Christ. And finally, Pastor Endalk Ayo and Four Corners Evangelical Ethiopian Church are beginning their third year as a church plant in the city of Silver Spring, Maryland. Through praying persistently, teaching Scripture faithfully, living with integrity, and other biblical core values, Four Corners EEC has been faithfully reaching people for Christ in partnership with SENT. Their worship gathering is attracting over 350 Ahmaric speaking Ethiopian adults weekly! We are humbled to partner with these faithful planters and brothers and sisters in our region! As we continue to advance the gospel alongside of them, please stand with us in our partnership through prayer and support. May we all say with the Apostle Paul, “For this reason, because I have heard of your faith in the Lord Jesus and your love toward all the saints, I do not cease to give thanks for you, remembering you in my prayers” (Ephesians 1:15-16). 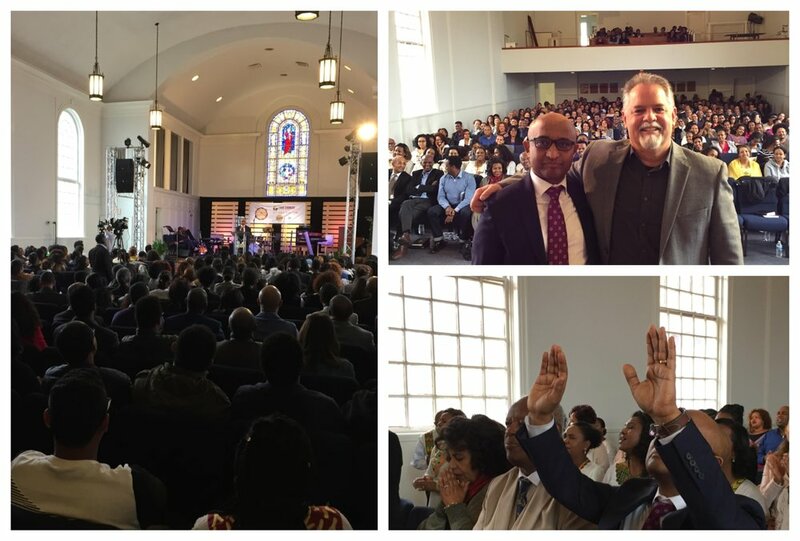 Pastor Endalk Ayo of Four Corners Evangelical Ethiopian Church and SENT Network Executive Director Mark McGeever (top right) celebrate their gospel partnership at the two-year anniversary of Four Corners EEC in Silver Spring, Maryland. Pastor Eric So and his family (bottom right) celebrate the one-year anniversary of Peace City Church with their congregation in Riverdale, Maryland. Pastor Adam Muthaseb and SENT Network Executive Director Mark McGeever (left) celebrate Redemption City Church’s one-year anniversary in Baltimore, Maryland.